It is not generally enough for an executive to be intelligent, to work hard or to be knowledgeable for being effective. Effectiveness is something which is different and distinct. But to be effective, the executive does not need special assistances, aptitude, or training. He is required to do certain and fairly simple things. These simple things consist of a few practices which are not inherited. These things are required to be learned. After learning, these things are to be practiced until they become habits. The executive, who works for becoming an effective executive, always succeeds in doing so. 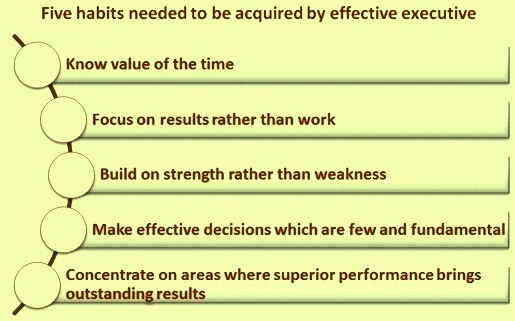 Effectiveness can be learned and for an executive to be effective it is necessary that he learns effectiveness. Effectiveness is what executives always need for their performance at work. Without effectiveness there is no performance, no matter how much intelligence and knowledge goes into the work, no matter how many hours it takes. Yet it is perhaps very surprising that very little attention is paid by executives towards effectiveness. In the present day environment, an executive is expected to spend all of his working life in an organization of some kind. His effectiveness depends increasingly on his ability to be effective in the organization, to be effective as an executive and to have abilities to perform. Perhaps even his ability to survive in the organization increasingly depends on how effective executive he is for the organization. As a matter of fact, effectiveness for an executive is a key requirement for his individual achievements and accomplishments. It is the prime requirement for him to carry out his job efficiently. Since he is expected first of all to get the right things done, which simply means that he is expected to be effective. But usually in most of the organizations, executives of high effectiveness are rarely found. High intelligence is usually very common among the executives in an organization, while the imagination is far from rare. The level of knowledge also tends to be high. But there seems to be very little correlation between the executive’s effectiveness and his intelligence, his imagination or his knowledge. Bright executives are frequently strikingly not very effective. They normally fail to realize that the brilliant insight by itself is not an achievement. They never have learned that insights become effectiveness only through hard systematic work. Equally, in every organization there are some highly effective laborious persons. While others rush around in the frenzy and busyness which very bright persons so often confuse with creativity, the laborious persons puts one foot in front of the other and gets there first. Intelligence, imagination, and knowledge are essential resources, but only effectiveness converts them into results. By themselves, they only set limits to what can be attained. Though the organizations apparently need effective executives, yet very little attention is given to effectiveness. One reason for this neglect is that effectiveness is the specific technology of the knowledge worker within an organization. For manual work what is needed, is only the efficiency, which is the ability to do things right rather than the ability to get the right things done. The manual worker can always be judged in terms of the quantity and quality of a definable and discrete output. It is always possible to measure efficiency and to define quality in manual work. Earlier during the period, when the manual worker predominated in the organizations, then only few persons of effectiveness were needed. These persons were generally at the top management who gave the instructions which others were to carry out. These persons were so small a fraction of the total work force in the organization that their effectiveness, rightly or wrongly, was always taken for granted. This is also considered to be natural since in any area of human endeavor there are always a few persons who somehow know what the rest of the majority of persons has to learn the hard way. In other words, up to recent times, the major problem of an organization was the efficiency in the performance of its manual worker who did what he had been told to do. Knowledge workers were few in the organization. In fact, only a small fraction of the knowledge workers of earlier days were part of the organization. Most of them worked by themselves as professionals and at best assisted by a support staff. Their effectiveness or lack of effectiveness concerned only themselves and affected only them. Today, however, every organization has a large force of knowledge workers which has become reality of the present time. In the present day environment, the centre of gravity has shifted to the knowledge worker, the man who works with his mind rather than his muscles or the skill of his hands. Increasingly, the majority of the work force works in the organization that has been trained to use knowledge, theory, and concept rather than physical force or manual skill. This work force is effective insofar as it can make a contribution to the organization. Now effectiveness can no longer be taken for granted. It can neither be neglected any longer. The imposing system of measurements and tests which have been developed for manual work through industrial engineering and the quality control methods are not applicable to knowledge work. Working on the right things is what makes knowledge work effective. This is not capable of being measured by any of the yardsticks for manual work. The knowledge worker cannot be supervised closely or in detail. He can only be helped. But he is to direct himself towards his performance and contribution, that is, towards his effectiveness. One can indeed never be sure what the knowledge worker thinks, though thinking is his specific work and he does his work by thinking. The motivation of the knowledge worker depends on his being effective, on being able to achieve the results. If effectiveness is lacking in his work, his commitment to work and to his performance and contribution soon declines, and he becomes a time passer just going through the motions during his working hours. The knowledge worker does not produce something which is effective by itself. He does not produce a physical product. He produces knowledge, ideas, information. By themselves these products have no value. Some other worker, which is another knowledge worker, has to take them as his input and convert them into his output before they have any reality. The greatest wisdom not applied to action and behaviour is meaningless data. Hence, the knowledge worker is required to do something which a manual worker need not do. He must provide effectiveness. He cannot depend on the utility his output carries with it as does an efficiently produced quality product. The knowledge worker is the one of the reason of the efficiency in production through which helped the highly developed societies and economies of today not only to become but also remain competitive. Education is the one area which can make the knowledge worker productive. And productivity of the knowledge worker means the ability in getting the right things done. It means effectiveness. All the executives are knowledge worker in a modern organization by virtue of their position or knowledge. They are responsible for a contribution which materially affects the capacity of the organization to perform and to achieve the results. This ensures the organization to carry out its activities in an efficient manner in the environment in which it is functioning. These executives are required to make decisions. They cannot just carry out the orders. They are required to take responsibility for their contribution. And by virtue of their knowledge, they are supposed to be better equipped to make the right decision than anyone else. They are required to contribute to the goals, the standards, and the standing of the organization. Today in many of the organizations even non-executives are in a positions of responsibility, decision making and authority, and they are required to contribute professionally. They have freedom to make decision based on their judgement of the situation, though the responsibility of the area lies with an executive. There are many executives in the organization who only oversee the work of their subordinates. They are superiors of other people who manage their work, but without the responsibility, the authority, the direction, the content, and the quality of the work, or the methods of its performance. They can still be measured and appraised very largely in terms of efficiency and quality, and by the yardsticks which are used to measure and appraise the work and performance of the manual worker. Such executives, in-fact, function as non-executives. Conversely, whether a knowledge worker is functioning as an executive does not depend on whether he manages people or not. In one organization, a market development manager may have a hundred persons working under him, whereas in the closest competing organization, the market development manager is carrying out the same functions all by himself along with only one support staff. This makes very little difference in the contribution expected of the two persons. It is an administrative detail. One hundred persons, of course, can do a great deal more work than one man. But it does not follow that they produce and contribute more. Many people working in the area of the market development is supposed to provide the results with that increment of insight, imagination, and quality which are to give the organization the potential of rapid growth and success. But this does not happen in practice since the work of these hundred persons lack effectiveness. It is very likely that the market development manager in the first organization is overwhelmed by all the problems the hundred persons bring to their work and cause through their interactions. He may be so busy ‘managing’ them so as to have no time for market development and for fundamental decisions. He may be so busy checking figures that he may not be clear about the potential market of the organization. And as a result, he may fail to notice significant changes in the market which eventually may cause the downfall of the organization. But the individual market development manager without a person under him may be equally productive or unproductive. He may be the source of the knowledge and vision which make the organization prosper. Or he may spend so much of his time hunting down details and he does not see and hear anything and think even less thus causing downfall of his organization. Knowledge work is not defined by quantity. Neither is knowledge work defined by its costs. Knowledge work is defined by its results. And for these, the size of the group and the magnitude of the managerial job are not even symptoms. Organization having the knowledge workers has persons who manage no one and yet are executives. These persons may make the tactical decision that determines the future of the organization. They may be in any position which can be very senior or very junior in the organization. The executives are those knowledge workers, managers, or individual professionals who are expected by virtue of their position or their knowledge to make decisions in the normal course of their work which have significant impact on the performance and results of the whole organization. They are by no means a majority of the knowledge workers. Since in knowledge work too, as in all other areas, there is routine and unskilled work. But they are a much larger proportion of the total knowledge work force then the organization chart ever reveals. This is to be understood that there are many persons in the organization who have to make decisions of significant and irreversible impact. For the authority of knowledge is surely as legitimate as the authority of position, there is normally no problem of effectiveness. Many persons in the organization are not noted for their capacity to organize themselves and their work. But few of them have much trouble being effective. The executive in the organization is in an entirely different position. In his situation there are four major realities over which he has essentially no control. Each of these is built into the organization and into the executive’s day and work. He has no choice but to ‘cooperate with the inevitable’, since each of these realities exerts pressure toward non-results and non-performance. Reality number 1 – The time of the executive tends to belong to everyone else. If a person attempts to define an ‘executive’, operationally (that is, through his activities), then he defines him as a captive of the organization. Anyone can move in on his time, and everyone does. There seems to be very little the executive can do about it. He cannot, as a rule, can say that he will not meet anybody for the next half an hour. Even when he is in a meeting with someone, if at that moment, his telephone rings then he cannot avoid speaking to the caller and his time is spent in an activity not planned by him. Reality number 2 – Executive is forced to keep on ‘operating’ unless he takes positive action to change the reality in which he lives and works. The usual complaint is that the executive when he is promoted to a senior management position still continues to operate in the previous position though his time is needed for the responsibilities of the new position. This is sometimes blamed to the fact that the executives, as a rule, out of functional work and operations, and cannot cast off their habits of a lifetime when they get into senior management position. The fundamental problem is the reality around the executive. Unless he changes it by deliberate action, the flow of events determines what he is concerned with and what he does. But events rarely tell the executive anything, let alone the real problem. The executive is concerned with a situation which is complex and universe. The events themselves do not indicate that they are important and relevant or they are merely distractions. If the executive lets the flow of events determine what he is to do, what he is to work on, and what he is to take seriously, and then he is wasting himself since he is just operating. He may be an excellent person, but he is certain to waste his knowledge and ability and to throw away what little effectiveness he might has achieved. The needs of the executive are the criteria which enable him to work on the truly important, that is, on contributions and results, even though the criteria are not found in the flow of events. Reality number 3 – The third reality which is pushing the executive toward ineffectiveness, is that he is within the organization. This means that he is effective only if and when other persons make use of what he contributes. Organization is a means of multiplying the strength of an individual. It takes his knowledge and uses it as the resource, the motivation, and the vision of other knowledge workers. Knowledge workers are seldom in tune with each other, precisely since they are knowledge workers. Each has his own skill and his own concerns. His area of interest can vary. Each has to be able to use what the other produces. Normally the persons who are most important to the effectiveness of an executive are not the persons over whom he has direct control. They are persons working in other areas. They are persons who in terms of organization, are sideways. Or they are his superiors. Unless the executive can reach these persons, can make his contribution effective for them and in their work, he has no effectiveness at all. Reality number 4 – Reality number 4 is that the executive works within the organization. He is to see the inside of the organization closely since it is the immediate reality. He is to see the outside only through thick and distorting lenses, if at all. The things which are going on outside are usually not even known firsthand. They are received through an organizational filter of reports which are usually in an already predigested and highly abstract form that imposes organizational criteria of relevance on the outside reality. Also the organization is considered to be a concept. It is to be represented as a point which is neither having size nor extension. Even a very big organization is usually unreal compared to the reality of the environment in which it exists. Specifically, there are no results within the organization. All the results are on the outside. As an example, the operating results are produced by customers who convert the costs and efforts of the organization into revenues and profits through their willingness to exchange their purchasing power for the products or services of the organization. The customers are the decision-makers who are outside the organization. What happens inside the organization is the effort and cost. To speak of ‘profit centres’ in the organization, as the people are accustomed to do, is polite understatement. There are only effort centres. The less the organization has to do to produce results, the better it does its job. The outside environment is the true reality and it is well beyond effective control from the inside. At the most, the results can be co-determined. In the organization, there can be attempts to mould the customers’ preferences and values through promotional campaigns and advertising. The customer still has the final word and the effective veto power. But it is the inside of the organization which is most visible to the executive. It is the inside that has nearness to him. Its relations and contacts, its problems and challenges, its crosscurrents and chatter reach him and touch him at every point. Unless he makes special efforts to gain direct access to outside reality, he becomes increasingly focused with inside. The higher up in the organization he goes, the more his attention is drawn to the problems and the challenges of the inside rather than to events on the outside. These are the four realities which the executive cannot change. These are necessary conditions for his existence. Hence, he must know that he will be ineffectual unless he makes special efforts to learn to be effective. The level of executive performance, achievement, and satisfaction can be increased significantly by increasing their effectiveness. It is possible to use persons of great abilities in several places. It is also possible to have persons with wider knowledge. But, it is not easy to get such persons even with great efforts. Then why organizations make additional efforts where there is very little probability to get results. In fact, organizations are to run and being run with the persons which are available in a normal manner without any additional efforts. The literature on management development visualizes the manager of tomorrow as to be a ‘man for all seasons’. A senior executive, as foreseen, is required to have extraordinary abilities as an analyst and as a decision-maker. He is to be good at working with people and at understanding organization and power relations. He is also to be good at mathematics, and to have artistic insights and creative imagination. In other words, he is to be universal genius, and universal geniuses are persons which are not available easily. So, it is necessary to man the organization with the persons which are available in a normal manner. Such persons generally, at best, excel in one of the above abilities. They are likely to lack in other abilities or may have very little knowledge in the other abilities. Under this environment, it is essential to learn to build the organization in such a manner that any person who has strength in one important area is capable and have an environment to put his ability to work. It is also not practical to expect to get the needed executive performance by raising the standards for their abilities, let alone by hoping to get the universally gifted person. Hence, it is essential to extend the range of persons through the tools they are to work with rather than through a sudden quantum jump in their ability. The same, more or less, applies to knowledge. However badly the organization may need people of more and better knowledge, the effort needed to make the major improvement may be much greater than the possible and probable expected return. Many of the operations research studies and several of management development programmes plead for the multi-disciplinary approach for the staffing of the organization. As per this approach, people in the organization are to be capable of doing superior and original work in many areas of human knowledge. People may have the basic knowledge of these areas but they are not expected to be specialists in all the areas. One of the weaknesses of young, highly educated people these days is that they are satisfied to be proficient in one narrow specialty and have dislike for the other areas. One need not know in detail what to do with human relations as a plant operator, or how to promote a new product of the organization as a maintenance engineer. But one has a responsibility to know at least what these disciplines are about, why these are around, and what these disciplines are trying to do. One need not know what reactions are taking place inside a blast furnace but the people are to better know the basics of ironmaking. What is being discussed is, however, something very different from the universal expert, who is as unlikely to be available as the universal genius are not normally available. Instead the organizations are to learn how to make better use of the persons who are good in any one of the areas of expertise. This can be done by increasing their effectiveness. If it is not possible to increase the supply of a resource, then it becomes essential to increase its yield. And effectiveness is the one tool to make the ability and knowledge of the resource to yield more and better results. Effectiveness thus warrants high priority because of the needs of organization. It deserves even greater priority as the tool of the executive and as his access for obtaining achievement and performance. Effectiveness is not the thing which people get by birth. But then the question arises whether effectiveness can be learned. Still, the issues are (i) what effectiveness consists of, (ii) what a person has to learn to be effective, (iii) what kind of the learning it is, (iv) whether it is a knowledge which a person learns in systematic form and through concepts, (v) whether it is a skill which a person learns as an learner, or (vi) whether it is a practice which a person learns through doing the same elementary things repeatedly. Effectiveness can be explained in two ways through the example of the role of a consultant. As per first way, a consultant who by definition has no authority other than that of knowledge must himself be effective, or else he is nothing. As per the second way, the most effective consultant depends on people within the customer organization for getting anything done. Further, the consultant’s effectiveness is determined by the analysis whether he contributes and achieves results, or whether he is simple ‘cost centre’ or at best a management entertainer. Actually, there is no effective personality. The effective executives normally differ widely in their temperaments and their abilities, in what they do and how they do it. They differ widely in their personalities, their knowledge, and their interests. In fact they differ in almost everything which is used to normally distinguish the people. All they have in common is the ability to get the right things done. Among the effective executives, there are people who are extroverts and aloof, retiring men, or some even morbidly shy. Some can be eccentrics while the others can be painfully correct conformists. Some can be fat while others can be lean. Some can be full of worries while the others can be relaxed. Some can be heavy drinkers while others can be teetotalers. Some can be men of great charm and warmth while others can have a very dull personality. There can be a few persons who fit into the popular conception of a leader while others can be colourless persons who would attract no attention even in a crowd. Some can be scholars and serious students while others can be almost illiterate. Some can have broad interests while others know nothing except their own narrow area of expertise and care for little else. Some of the persons can be self-centered, if not indeed selfish, while the others can be generous of heart and mind. There can be persons who live only for their work while the others are persons whose main interests lie outside say in the social service. Among the effective executives, there can be people who use logic and analysis while others can be the persons who rely mostly on perception and intuition. There can be persons who make decisions easily and there can be persons who anguish every time they have to make decision. Effective executives, in other words, differ. They differ as widely as do ineffectual ones. They are indeed indistinguishable from ineffectual executives in type, personality, and talents. What all the effective executives have in common is the practices which make them effective in whatever they have and whatever they are. And these practices are the same, wherever the effective executive works. An executive, no matter how great in his intelligence, his diligence, his imagination, or his knowledge, who fails to observe these practices, is normally found to be deficient in effectiveness. Effectiveness, in other words, is a habit which is just a complex of practices. And practices can always be learned. Practices are simple, deceptively so, since they are always usually extremely hard to become a habit for doing well. They have to be acquired, the same way as a person does when he learns the multiplication table, that is, repeated several times till ‘9 x 5 = 45’ has become unthinking, conditioned reflex, and firmly ingrained habit. Practices one learns by practicing and by practicing again and again. There is no reason why a person with normal talent cannot acquire competence in any practice. Mastery might well evade him since for this; a person may need special talents. But what is needed in effectiveness, is the competence. What is needed are the will for effectiveness. There are essentially five practices, five such habits of the mind which are needed to be acquired to become an effective executive (Fig 1). These five habits are given below. Effective executives know the value of their time. They work systematically at managing every minute of their time which can be brought under their control. Effective executives focus on outward contribution. They direct their efforts for getting results rather than to work. They start by finding out what results are expected out of him rather than with the work to be done, let alone with its techniques and tools. Effective executives build on strengths, their own strengths, the strengths of their superiors, colleagues, and subordinates, and also on the strengths available in the situation, that is, on what they can do. They do not build on weakness. They do not start out with the things they cannot do. Effective executives make effective decisions. They know that it is, above all, a matter of system and of the right steps in the right sequence. They know that an effective decision is always a judgment based on ‘dissenting opinions’ rather than on ‘consensus on the facts’. They also know that to make several decisions quickly means to make the wrong decisions. They are aware that what is needed is few, but basic, decisions. What is needed is the right strategy rather than dramatic tactics. Effective executives concentrate on the few major areas where superior performance can produce outstanding results. They force themselves to set priorities and stay with their priority decisions. They know that they have no choice but to do first things first and second things not at all. The alternative is to get nothing done.